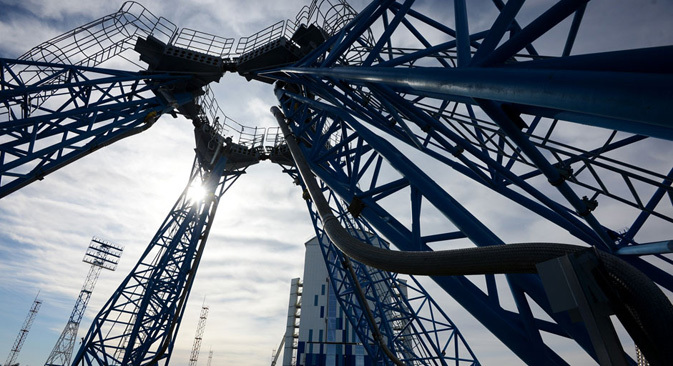 Vostochny Cosmodrome in Russia's Far East. Despite problems, first launches from the new cosmodrome in the Far East are scheduled to take place in April. Most of the space launches organized by Russian space agency Roscosmos — from communications satellites to supply ships to the International Space Station — do not leave the earth’s atmosphere from within Russia’s borders. Instead, these objects take off from the Baikonur Cosmodrome, deep in the steppes of Kazakhstan. Russia pays Kazakhstan $115 million per year for the use of the former home of the Soviet space program. In 2004 the presidents of the two countries signed an agreement extending the contract through 2050. The Vostochny Spaceport, under construction in the Amur Region of Russia’s Far East, was supposed to solve this problem. Construction began with great fanfare in 2011 under President Dmitry Medvedev, who named space one of the top five priorities in his national modernization program. Today, however, construction is far behind schedule and President Vladimir Putin has made it clear that the situation is unacceptable. During a visit to the site with a group of senior space officials in October, Putin ordered launches to begin by Cosmonauts Day next April. The major construction at Vostochny, which involves building 10 pads for both manned and unmanned launches, has also been riven by corruption scandals. Twenty criminal cases have been opened into thefts related to the construction ,and more than 220 officials are implicated. Yury Hrizman, the former head of state construction agency Dalspetstroy, is now facing criminal charges for corruption and embezzlement of funds. The cost of the spaceport has ballooned to $5.8 billion. Workers have also complained that they have not been paid back wages for up to four months of work. More than 100 workers went on strike to protest. Last summer, thousands of university students were brought to the site to spend their vacations helping with the construction. “Let’s agree on this: you complete work on the water supply, electricity and sewage … and get ready for a first launch in 2016, sometime in the spring,” Putin said. But space industry officials still have high hopes for Vostochny — both for its potential to bring back some of the glamour and glory associated with the Soviet launches from Baikonur, and to be a reliable source of income for modern commercial launches. Vostochny will become the main launching pad for Russia’s new Angara heavy booster rocket, the replacement for the aging Proton cargo ship. Once a world leader in boosting commercial payloads into space, the Proton has suffered a number of serious accidents including one explosion broacast live on national TV during a much-hyped launch. Before the problems with Proton, Russia was one of the leading players in commercial launches, earning almost $759 million in 2013 from those launches, according to a report by the U.S. Federal Aviation Administration report released in 2014. The figure was only $218 million in 2014 due to the problems with Proton. With the modern Angara, Russia wants to boost its commercial activity, and the demand is there. Private companies and foreign governments alike are interested in a reliable partner to send satellites into space. But even at full capacity, Vostochny will only have two launch pads for Angara rockets, and likely demand will mean that Russia still needs access to Baikonur. Charles P. Vick, senior space policy and technology analyst at Globalsecurity.org in Washington, said that Vostochny’s potential is still unknown. “Russia will continue to need both space ports for future requirements for crewed space missions, or they will be limited operating out of Vostochny in spite of what is suggested”, Vick said. The selection of the site for the Vostochny Spaceport was no accident. ”The Far East is still a wild place as far as infrastructure and population so we need it to have an outpost in the Far East,” said Yury Salnikov, a prominent space historian and documentary filmmaker. Officials hope that the spaceport might prove an attractive place to work for young scientists and engineers who could bring new life to the region. A simple online search for “Vostochny” shows “job vacancies” among the first results. According to Yury Vlasov, acting head of the United Space and Rocket Corporation, the Russian space industry will need more than 110.000 engineering graduates over the next 10 years, primarily for positions at Vostochny. Salnikov has also noted Vostochny’s proximity to China as one of its main seling points. While China has its own space ambitions, there is plenty of room for cooperation with Russia. The countries have already discussed plans for a moon station to be organized from Vostochny. Russia’s cosmodromes: what comes after Baikonur?